I must ask, do you really trust God? Do you depend on Him? This Bible study will encourage you to always rely on God. Enjoy! We have a great Religious Leader over the house of God. 22 And so let us come near to God with a true heart full of faith. Our hearts must be made clean from guilty feelings and our bodies washed with pure water. 23 Let us hold on to the hope we say we have and not be changed. We can trust God that He will do what He promised [Hebrews 10:21-23 (NLV)]. In any relationship trust is important. It is the foundation of hope and faith. Hopefully, the Lord has done something to gain your trust. If you do not trust God, then you do not have faith in Him. In addition, you do not hope for the promise of a life that will not end. So, make time for this Bible study and learn to trust God. To place confidence in; to rely on, to confide, or place faith in. God should be the object of your trust. But I trusted in thee, O Lord: I said, Thou art my God [Psalms 31:14]. Combine faith, hope, and trust in God to grow strong in the Lord. Our hope comes from God. May He fill you with joy and peace because of your trust in Him. May your hope grow stronger by the power of the Holy Spirit [Romans 15:13 (NLV)]. Be like the psalmist and learn to depend on God. I depend on God alone; I put my hope in him. 6 He alone protects and saves me; he is my defender, and I shall never be defeated. 7 My salvation and honor depend on God; he is my strong protector; he is my shelter [Psalms 62:5-7 (GNT)]. It is good for you to put your trust in God. For in times of trouble you can depend on the Lord God. For, lo, they that are far from thee shall perish: thou hast destroyed all them that go a whoring from thee. 28 But it is good for me to draw near to God: I have put my trust in the Lord GOD, that I may declare all thy works. (KJV). I was in trouble, so I called to the Lord for help. The Lord answered and made me free. 6 The Lord is with me, so I will not be afraid. No one on earth can do anything to harm me. 7 The Lord is my helper. I will see my enemies defeated. 8 It is better to trust in the Lord than to trust in people. 9 It is better to trust in the Lord than to trust in great leaders (ERV). Have you put your trust in God, do you really trust Him? By trusting God, you prove that you believe in Him and His word. When you trust God, you can put your mind at rest knowing that He will never fail/abandon or forsake/forget you. The Scriptures confirm this in Deuteronomy 31:6 Be strong and of a good courage, fear not, nor be afraid of them: for the LORD thy God, he it is that doth go with thee, he will not fail thee, nor forsake thee (NWB). Trust the honest, just, and faithful God, He is dependable and reliable. Take your rest in the Lord, waiting quietly for him; do not be angry because of the man who does well in his evil ways, and gives effect to his bad designs. 8 Put an end to your wrath and be no longer bitter; do not give way to angry feeling which is a cause of sin (BBE). Even the apostles had difficult times, but they continued to trust God to see them through the hard times. When you suffer, when you hurt and feel like you cannot go on, remember Trust in Him at all times, ye people; Pour out your heart before Him; God is a refuge for us [Psalms 62:8]. Place all your anxious cares upon God [in prayer], because He genuinely cares about you. 10 And the God who bestows every unearned favor [upon His people], who invited you to partake of His eternal splendor through Christ Jesus, will restore, confirm, strengthen and stabilize you people [in the faith], after you have gone through a brief time of suffering. 11 May God have total authority over everything [including your circumstances] forever. May it be so (AUV). Take advantage of the apostles experience. Do not wait until you are in a crisis. Now is the time to start trusting God. My friends, I want you to know what a hard time we had in Asia. Our sufferings were so horrible and so unbearable that death seemed certain. 9 In fact, we felt sure that we were going to die. But this made us stop trusting in ourselves and start trusting God, who raises the dead to life. 10 God saved us from the threat of death, and we are sure that he will do it again and again. 11 Please help us by praying for us. Then many people will give thanks for the blessings we receive in answer to all these prayers (CEV). G3982 – trusting in verse 9 comes from the Greek word πείθω peitho (pei’-thō) v. 1. to trust, have confidence, be confident in. 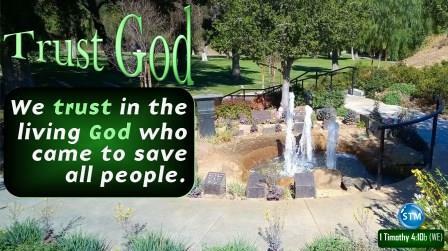 Trust God – We trust in the living God who came to save all people. Why trust God? Because you can, His word is true; there are far too many reasons to list them here, but read these Scriptures and see if they help you know why you trust Him or why you should trust God. ♦ Psalms 84:11-12 For the LORD God is a sun and shield: the LORD will give grace and glory: no good thing will he withhold from them that walk uprightly. 12 O LORD of hosts, blessed is the man that trusteth in thee. ♦ Romans 8:31-32 What shall we then say to these things? If God be for us, who can be against us? 32 He that spared not his own Son, but delivered him up for us all, how shall he not with him also freely give us all things? ♦ Psalm 91:1-2 Whoever rests in the shadow of the Most High God will be kept safe by the Mighty One. 2 I will say about the Lord, “He is my place of safety. He is like a fort to me. He is my God. I trust in him (NIRV). Tell the Christian brothers and sisters these things and you will do the work of Christ Jesus well. Your own heart will be fed by the things you have believed and the good teaching you have followed. 7 Have nothing to do with foolish stories. Make yourself strong in the things that please God. 8`To make the body strong helps a little, but the things of God help us in all ways. The things of God promise us life now and life in heaven.’ 9 These are true words and everyone should believe them. 10 That is why we work hard and put up with troubles. We trust in the living God who came to save all people. He makes a way for those who believe in him (see note). 11 Tell people these things and teach them to do them (WE). NOTE: verse 10c “He makes a way for those who believe in him.” is stated differently in other translations including the KJV ‘specially of those that believe’. Jesus did come to save all (i.e., those in this world) as stated John 3:17 (RKJNT) For God did not send his Son into the world to condemn the world; but that the world might be saved through him” [read John 3:1-21]. Only those who believe in God will be saved; He who believes and is baptized shall be saved; but he who does not believe shall be condemned [Mark 16:16 (RKJNT)]. He who believes in the Son of God has the testimony in himself: he who does not believe God has made him a liar; because he does not believe the testimony that God has given regarding his Son. 11 And this is the testimony, that God has given to us eternal life, and this life is in his Son. 12 He who has the Son has life; he who does not have the Son of God does not have life. 13 These things I have written to you who believe in the name of the Son of God; that you may know that you have eternal life. The Lord God is trustworthy. Jesus said “Write: for these words are true and faithful” (Revelation 21:5). In other words the word of God can be trusted. Yes my friend, you serve a faithful God. G4103 faithful is from the Greek word πιστός pistos (piy-stos’) adj. 1. trusty, faithful. 2. that can be relied on. [from G3982] KJV: believe(-ing, -r), faithful(-ly), sure, true. The One who was sitting on the throne said, “Look! I am making everything new!” Then he said, “Write this, because these words are true and can be trusted.” 6 The One on the throne said to me: “It is finished! I am the Alpha and the Omega, the Beginning and the End. I will give free water from the spring of the water of life to anyone who is thirsty. 7 Anyone who wins the victory will receive this. And I will be his God, and he will be my son. 8 But those who are cowards, who refuse to believe, who do evil things, who kill, who are sexually immoral, who do evil magic, who worship idols, and who tell lies—all these will have a place in the lake of burning sulfur. This is the second death” (ICB). We were already chosen to be God’s own children by Christ. This was done just like the plan He had. 12 We who were the first to put our trust in Christ should thank Him for His greatness. 13 The truth is the Good News. When you heard the truth, you put your trust in Christ. Then God marked you by giving you His Holy Spirit as a promise. 14 The Holy Spirit was given to us as a promise that we will receive everything God has for us. God’s Spirit will be with us until God finishes His work of making us complete. God does this to show His shining-greatness (NLV). A short prayer from Psalms 7:1; 25:16-17 and 20-21 – O Lord my God, I put my trust and my faith in you; I come to you for protection from those who are cruel to me, those who cause me to suffer. Turn to me, and have mercy on me, for I am troubled, you know my pain. O take me out of my sorrows, I trust you to deliver me my hope is in you. Why would you not trust God? If you are born again, He is always with you; Do you not know that you are God’s temple, and that the Spirit of God dwells in you? Trust Him when you are in trouble and don’t seem to know what to do [1 Corinthians 3:16 (RKJNT)]. Trust God – He is full of mercy and compassion, He will not fail you. Blessings are and happiness is waiting for all who trust in God (Psalms 2:12). Because I trust God I, like a child, expect good things to happen in this life (Psalms 34:10; Ephesians 6:8) and more importantly I have full confidence in eternal salvation (2 Corinthians 3:1-18). And so can you! Be blessed my friends and continue to grow strong in the Lord. Always trust God—♥ Tim ☺. Summary: Hebrews 10:19-25 (21-23); Psalms 31:14-18 (14); Romans 15:7-13 (13); Psalms 62:5-8 (5-7). Trusting God: Psalms 73:27-28 and 118:5-9; Deuteronomy 31:1-8 (6); Psalms 37:7-8 and 62:5-8 (8); 1 Peter 5:5-11 (7 and 10-11); 2 Corinthians 1:8-11 (9-11). Why Trust God? 1 Timothy 4:1-11 (6-11); Proverbs 3:5-6; Isaiah 26:3-4. Psalms 84:11-12; Romans 8:31-32; Psalm 91:1-2. Mark 16:16; 1 John 5:10-13; Revelation 21:5-8. Wrap-up: Ephesians 1:3-14 (11-14); Psalms 7:1; 25:16-17 and 20-21; 1 Corinthians 3:16. Psalms 2:12 and 34:10; Ephesians 6:8; 2 Corinthians 3:1-18. 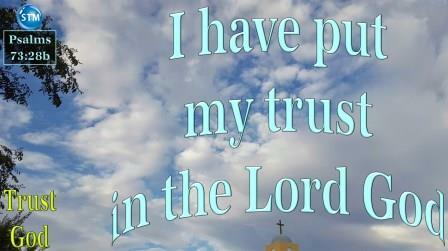 ♥ Question for “trust God”: Do you trust God even through hard times? Nav: Top || Trusting God || Why Trust God? Scripture quotations marked (CEV) are from the Contemporary English Version Copyright © 1991, 1992, 1995 by American Bible Society, Used by Permission. || (ERV) Taken from the HOLY BIBLE: EASY-TO-READ VERSION © 2001 by World Bible Translation Center, Inc. and used by permission. || (GNT) and (TEV) Scripture quotations marked (GNT) are from the Good News Translation in Today’s English Version- Second Edition Copyright © 1992 by American Bible Society. Used by Permission. || (ICB) Scripture taken from the International Children’s Bible®. Copyright © 1986, 1988, 1999 by Thomas Nelson. Used by permission. All rights reserved. || (WE) Taken from THE JESUS BOOK – The Bible in Worldwide English. Copyright SOON Educational Publications, Derby DE65 6BN, UK. Used by permission. Do not put your trust in people or things, you will be disappointed.… #trustGod. Enhanced for mobile devices ? have a peaceful day/evening! ? Trust God – Oh Lord, my God I trust YOU! Ephesians 1:11-14 God always does what he plans, and that’s why he appointed Christ to choose us. 12 He did this so that we Jews would bring honor to him and be the first ones to have hope because of him. 13 Christ also brought you the truth, which is the good news about how you can be saved. You put your faith in Christ and were given the promised Holy Spirit to show that you belong to God. 14 The Spirit also makes us sure that we will be given what God has stored up for his people. Then we will be set free, and God will be honored and praised. Thank you Godiva for commenting and for the love :-), I am delighted that you enjoyed the information, please come back as often as you can! It was really great sir ! I enjoyed reading this ! Thankyou for the information ! Have a blessed day ahead !